HOW DOES INTRINIO IDENTIFY SECURITIES? Intrinio's global security master is centered around Bloomberg's OpenFIGI symbology. Each security in our database has a unique FIGI, tied to the security and exchange for which that security trades. Along with a unique FIGI, each security also has a unique FIGI_Ticker, which is the standard ticker (such as DBK for Deutsche Bank AG) combined with the exchange code for the specific exchange you wish to reference. For example, continuing with DBK as the example, say I wanted to bring in the specific security trading on the German Stuttgart Exchange. 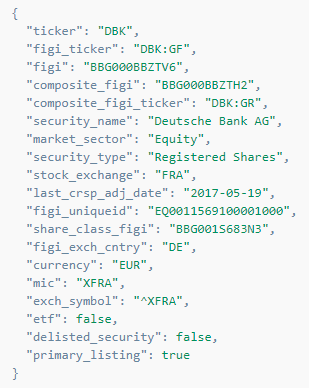 The exchange code for the Stuttgart exchange is GS, so the FIGI_Ticker for Deutsche Bank trading on the Stuttgart exchange is DBK:GS. This is critical when attempting to reference a specific security on a specific exchange. If you just specify DBK with no exchange code, for example, our system will choose the security trading on the primary exchange, which in this case is the German Frankfurt exchange with an exchange code of GF. WHAT ARE COMPOSITE FIGIs AND COMPOSITE FIGI TICKERS? Each security will also have a composite FIGI and composite FIGI Ticker. These identifiers are country composite IDs, corresponding to the primary security in that given country. For example, using DBK again, the country composite code for Germany is GR, so specifying the composite FIGI ticker DBK:GR will return the primary security trading on the Frankfurt exchange, which is DBK:GF. The FIGI of the primary security and the composite FIGI will also be the exact same, since those are linked together. HOW DO I FIND A SECURITY'S FIGI? That shows the primary FIGI, FIGI_Ticker, composite_figi and composite figi ticker for security DBK. HOW DO I FIND SECURITIES ON A SPECIFIC EXCHANGE OR AN EXCHANGE'S CODE? 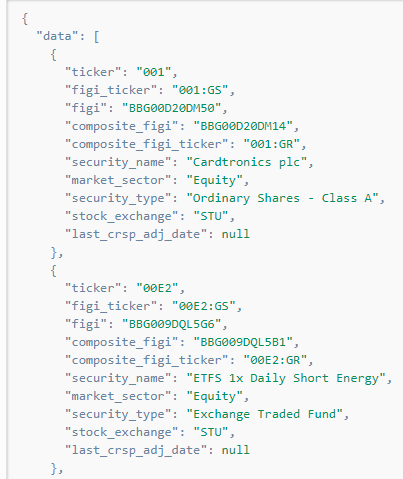 You can see that both securities have a figi_ticker exchange code of GS, corresponding to the Stuttgart exchange. They also both have a composite figi ticker exchange code of GR, corresponding to the country composite code for Germany. Need more information? Chat with us!